In just the span of a decade or two, it seems that nearly all environmental management writing (whether scientific reports, public awareness brochures, or policy briefs) has come to call on the notion of “ecosystem services” to defend the importance of healthy, functioning “natural” systems. What is this concept, where does it come from, what does it mean, and what doors does it open or close? Is “ecosystem services” the ultimate win-win idea that translates abstract values of a healthy environment into policy-relevant and policy-actionable chunks? Does it allow ecologists and economists to speak the same language, leading to better outcomes for the environment and for the rural (often marginalised) people who manage it? Or is it a tool of the “neoliberalization” of nature, another means by which capitalism penetrates into new terrains, creating new forms of accumulation in the hands of a global elite, further marginalising the poor? Or is it all of this – and more – at the same time? I’ve had the chance to be involved in two recent publications that address these questions. They arose out of a collaboration with CNRS researcher Xavier Arnauld de Sartre of the Societies-Environments-Territories Laboratory at the Université de Pau, and with Monica Castro-Larrañaga, who has recently finished post-docs both with Xavier and with Valérie Boisvert here at the University of Lausanne. From 2010 to 2013 Xavier coordinated a project financed by the French government (ANR) on geographic approaches to ecosystem services, with fieldwork components in both Brazil and Gabon. I participated as an external advisor to that project. 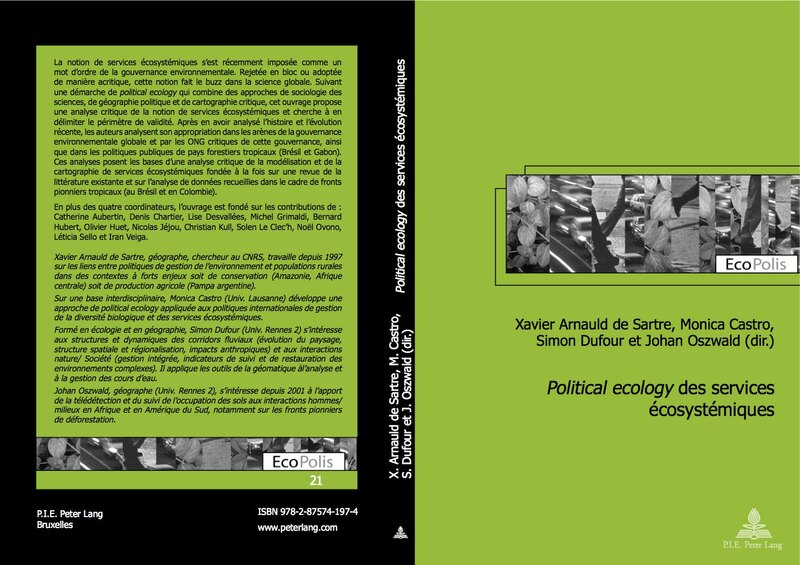 The final output of that project was a book (which I summarise below); first however, I describe an article that results of a merging of my own work on ecosystem services (a paper I prepared for the International Geographical Congress in Cologne) with highlights from Xavier and Monica’s work. political (who wins, who loses?). Because it deals with the intersection of history, discourse, ecology, and power we call it a “political ecology”. The article is in part a conceptual reflection, in part a literature review, in part summarizes Monica Castro’s bilbiometric analyses of ES in the scientific and policy literature, and in part relies on examples from Brazil and Madagascar. We argue that the dominance of “ecosystem services” as a guiding concept for environmental management – where it appears as a neutral, obvious, taken-for-granted concept – hides the fact that there are choices implicit in its framing and in its application. In other words, it is a highly political concept, and its utility depends on the arena in which it is used and what it is used for. We show how the concept is a “boundary object” with widespread appeal, trace the discursive and institutional context within which it gained traction, and argue that choices of scale, definition, and method in measuring ecosystem services frustrate its straightforward application. As a result, it is used in diverse ways by different interests to justify different kinds of interventions that at times might be totally opposed. In Madagascar, the ecosystem services idea is often used to justify forest conservation in ways that commodify nature and potentially disempower rural communities. In contrast, in the Brazilian Amazon, the discourse of ecosystem services has served the agendas of traditional populations and family farm lobbies, but in contradictory ways. We stress that ecosystem services, as an idea and tool, are mobilized by diverse actors in real-life situations that lead to complex, regionally particular and fundamentally political outcomes. Above is a video where I present some of the historical material mentioned in the article (it is for a MOOC on ecosystem services coordinated by Juliet Fall and Martin Scheffer of the University of Geneva). First, it asks what the perimeters are of the ecosystem services (ES) concept. What types of transformations of society-environment relations, of capitalism, and of governance does the concept imagine? And further, in order to question the supposed universality of the concept, what are the places – the networks, the spaces of interactions between actors across scales – where the concept is relevant? Who speaks of ES? From what institutions and disciplines? What debates do they have? Whose voices are the most heard? This section includes a more conceptual analysis of the term ES as symptomatic of ecological modernism, as a tool to solve our world’s environmental crises (Ch 1); a genealogical and bibliometric analysis of the scientific and institutional networks behind the term (Ch 2); and a political analysis of the debates behind the use of ES in the sphere of international negotiations, from the Millennium Ecosystem Assessment to the Rio +20 conference (Ch 3). The second part investigates more specifically how political actors across several tropical forest contexts utilize the ES concept. In a chapter on REDD, it reviews the enormous interest in this idea, but shows that actual projects are few and far in between on the ground, as contrasted to the highly visible REDD discourse that serves global pro- and anti-REDD interests (Ch 4). In the contrasting case studies of Gabon (Ch 5) and Brazil (Ch 6), the book shows that the notion of ES has had little influence on concrete policies. Rather, ES has been inserted as a supplemental tool to reinforce policies already in place, such as national scale conservation or support of family farms. The third part asks about the application of the concept ‘on the ground’ and ‘in science’. How does the concept modify our understandings and descriptions of reality? What doors are opened and closed? How does the concept function concretely? It shows that the ES concept offers a relevant analytical frame in certain well-defined domains. It investigates how the measurements (Ch 7) and the spatial representations (Ch 8, 9) of ES both open and close certain perspectives and avenues for action. The choice of services to measure, their representation in maps, and the use of cartography as a tool of empowerment are all ways in which ES can be used to advocate for particular interests on the ground. For me, the key message from our article and the book arises out of the juxtaposition of two critiques. On the one hand, it is important that ecological and environmental scientists have a better sense of the choices, politics, and consequences inherent in using the “ecosystem services” concepts. On the other hand, it behooves scholars prone to critique ES as simply another example of the “neoliberalization of nature” to look further: it isn’t so simple (on this note, an article that I think gives the best sympathetic critique of the “neoliberal natures” literature is one by Noel Castree and George Henderson here). This entry was posted on Tuesday, March 31st, 2015 at 7:46 pm and is filed under Book Review, Political ecology, Research, Sustainability. You can follow any responses to this entry through the RSS 2.0 feed. You can leave a response, or trackback from your own site. Yeah, yeah, I know…. Guilty as charged. Next one’s for JPE. What to do about the ‘neo-Australian’ forests of lowland eastern Madagascar?